The Chinese Mid Autumn Festival, also called the Moon Festival, takes place on October 3 this year. It celebrates the fifteenth day of the eighth month of the lunar calendar, when the moon is at its brightest for the year. There are several legends surrounding this holiday, and one of them explains the Lady in the Moon (her name is Chang Er), whom you see pictured on the tins in the upper right in the photo (maybe the lady on the left is, too, but it doesn’t look “moony” to me). Sweet filled Moon Cakes, with intricate stamped patterns on the pastry exterior, are all the rage for this festival, and are given as gifts in packaging that ranges from clever to sumptious. The cake on the left front of the photo had, I think, lotus seed paste filling, while the one cut open on the right was filled with nuts and fruits. My friend Georgia gives me one or two each year, and I sometimes buy them myself, if I happen across them (Penang restaurant often sells them). I just finished reading Jen Lin-Liu’s “Serve the People, a stir-fried journey through China,” and really enjoyed her account of learning to cook in the man’s world of restaurant kitchens in Beijing and Shanghai. 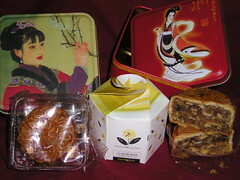 In the book Lin-Liu, who grew up in the U.S., wrote amusingly of moon cakes, calling them the Chinese version of fruitcakes, i.e., a gift that is re-gifted many times, and not necessarily eaten. She also mentions something I’ve read about, which are scandals about unused fillings being saved from year to year in dirty factories and remixed with newer ingredients for the new year. But she loved them as a kid, as I imagine all Chinese children would. The Moon Festival, which is a public holiday in parts of China, is celebrated with music and dancing, too, and moon gazing parties when the weather allows. And of course, it is just one of many harvest festivals celebrated by many cultures across the globe.